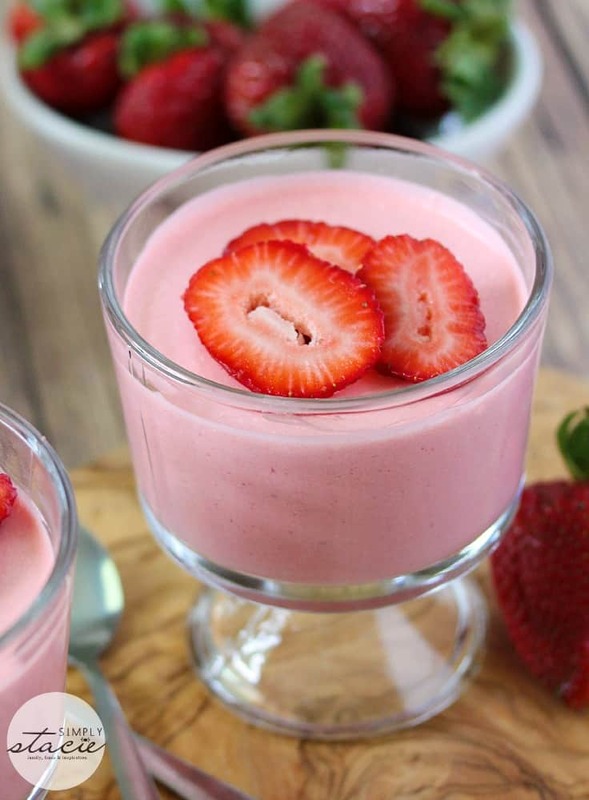 My Strawberry Mousse is so simple to whip up and is bursting with freshness and sweetness in every bite. 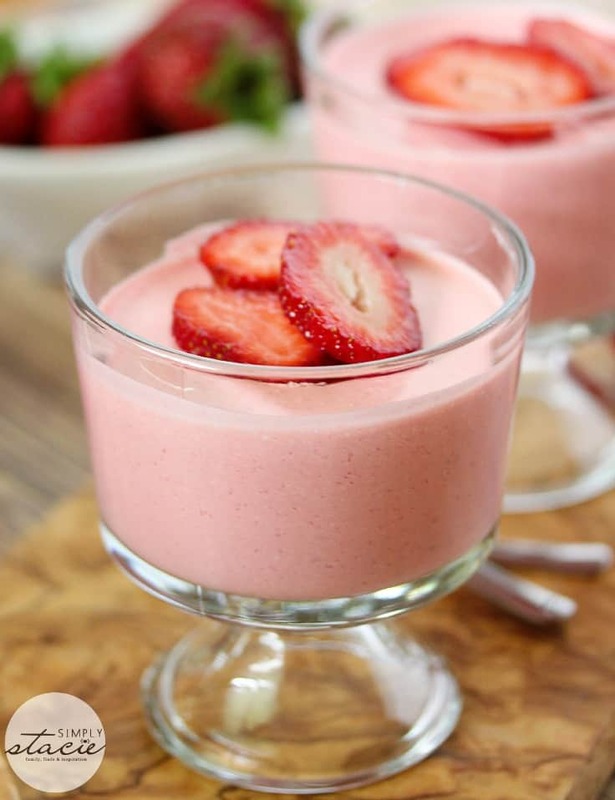 A no-bake creamy and fluffy strawberry mousse that will please the taste buds. Pretty enough to serve guests and easy enough to make often! If you are all like me and have a love affair with strawberry, this recipe is going to fit right into your liking. This is my go-to summertime dessert that we eat regularly in our home. Once I see our local strawberry farmers are selling ripe and fresh strawberries, we dive in head first! I never realized how easy it was to make a homemade mousse, and then one day I gave it a try! 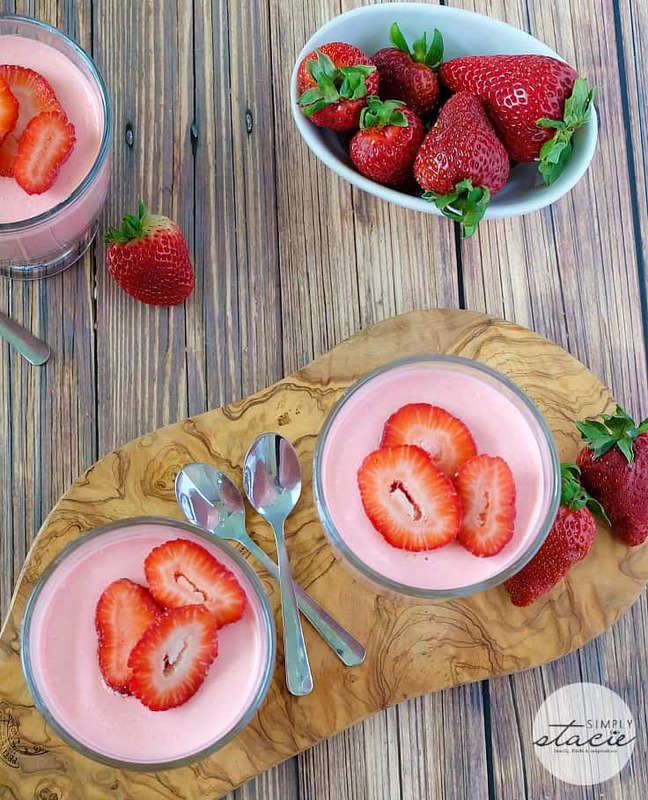 This indeed is one of the easiest strawberry desserts to whip up, for parties, a treat after supper, or surprise after school snack for your kids. The hardest part is allowing your mousse to set up in the fridge for a few hours! I use Strawberry Jello and fresh strawberries to work together to give you that vibrant and sweet strawberry flavor in each bite. Then you mix in the whipped topping for that light and airy texture that brings this dessert to a gold star status! I reached for Jello which is gelatin that is flavored with strawberry for this recipe. The gelatin is what helps give your mousse that thickness you are going to be looking for. If you find you could use it a little bit thicker add more whipped cream to your mix, blend and let it set up a bit longer. I used a four serving size packet of gelatin for my fresh Strawberry Mousse recipe. It was the perfect amount that seemed to give this mousse that light and fluffy texture I wanted. 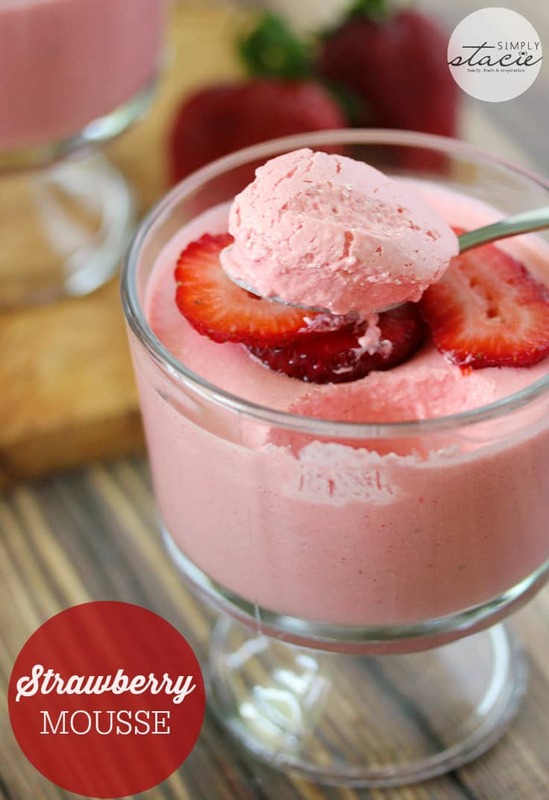 The Strawberry Mousse can last in the fridge at the proper temperature for three days tops. I would recommend eating it within day one or two for best flavor. You need to allow two hours for my Strawberry Mousse recipe to set up. If you serve it before then, it won’t have time to fully set and won’t be that light and airy texture you are looking for. My fresh Strawberry Mousse does need gelatin to help make the mousse set up correctly. Traditionally mousse is made with gelatin; it helps to give you that set up texture next to the light and fluffy aspect. 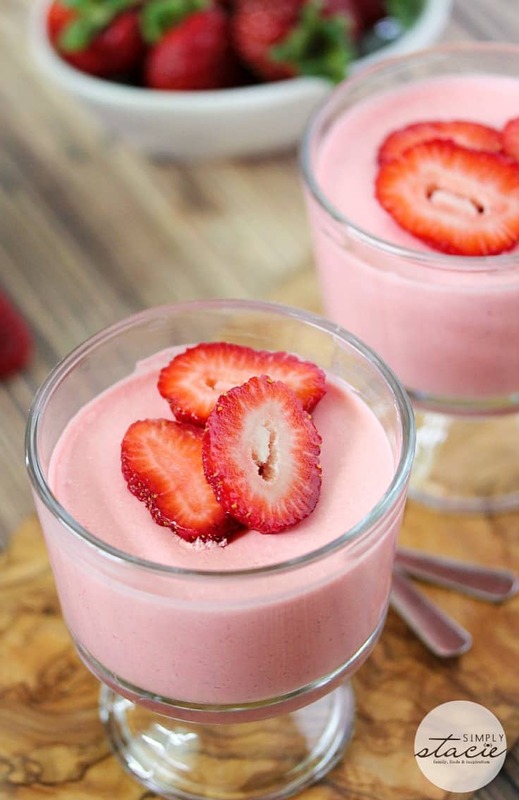 You can indeed freeze this Strawberry Mousse. It will slightly change the texture once it thaws at times, but you will still get that light and airy texture. Just wrap up and place in the freezer, making sure you have your mousse sealed adequately. Then when you are ready to eat, put in the fridge to allow it to thaw. Then serve. If you want to have fresh strawberries on top, I don’t recommend freezing fresh strawberries. As it freezes and then thaws for serving they will become pretty mushy. So save back fresh strawberries or buy new to top your mousse before serving. Whether you froze fresh strawberries or picked up a bag at the market, you can replace frozen with the fresh in the recipe. Just thaw your strawberries before you toss them into the blender to mix it up. If you don’t have time to wait for your strawberries to thaw, run the bag under cold water to speed up the thawing process. Then measure out the right amount of strawberries and toss it in. 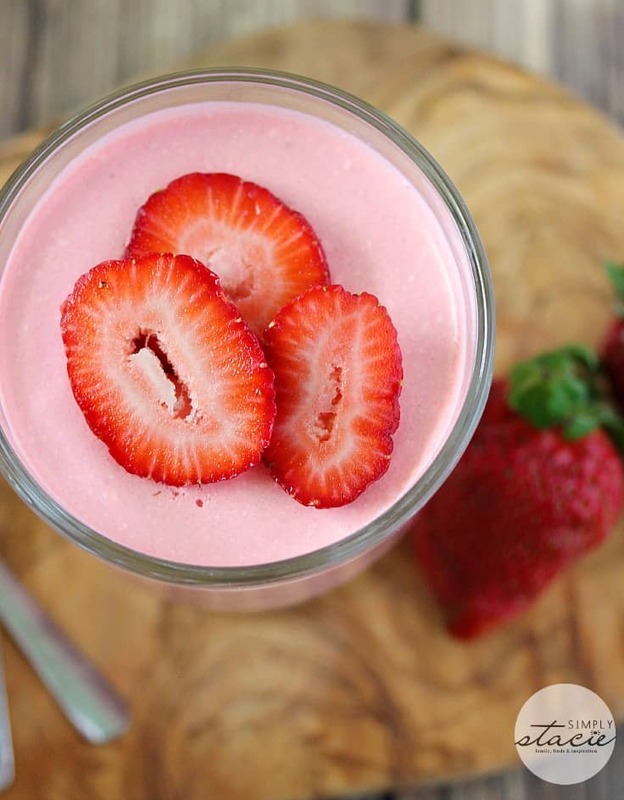 Most frozen strawberries are frozen at their prime, so you will still get that fresh flavor in your mousse. As you can see this is genuinely one easy recipe to follow and before you know it you have a dessert everyone can enjoy. Sprinkle on some chocolate chips for that chocolate covered strawberry flavor, add a dollop of whipped cream or fresh berries and dive in! 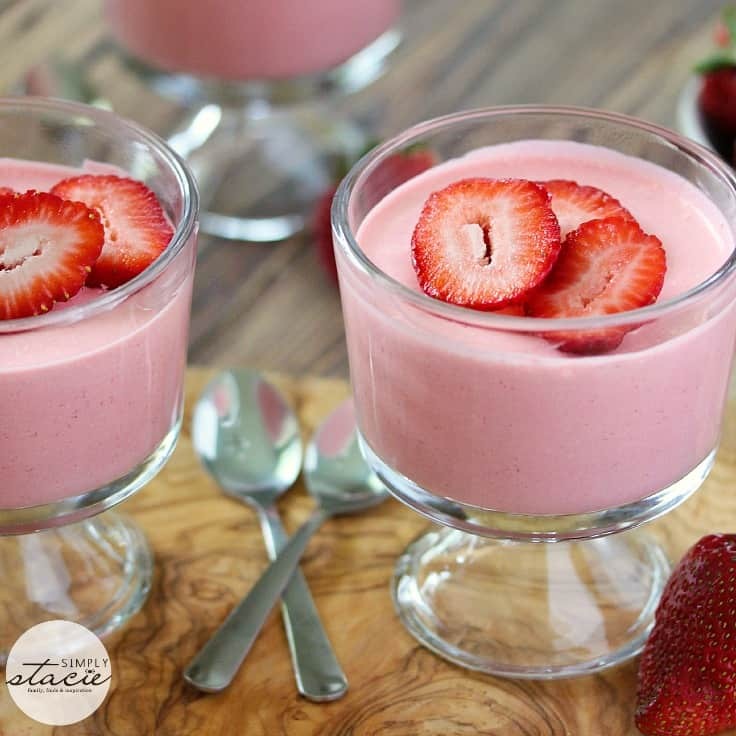 Have you made homemade Strawberry Mousse before? 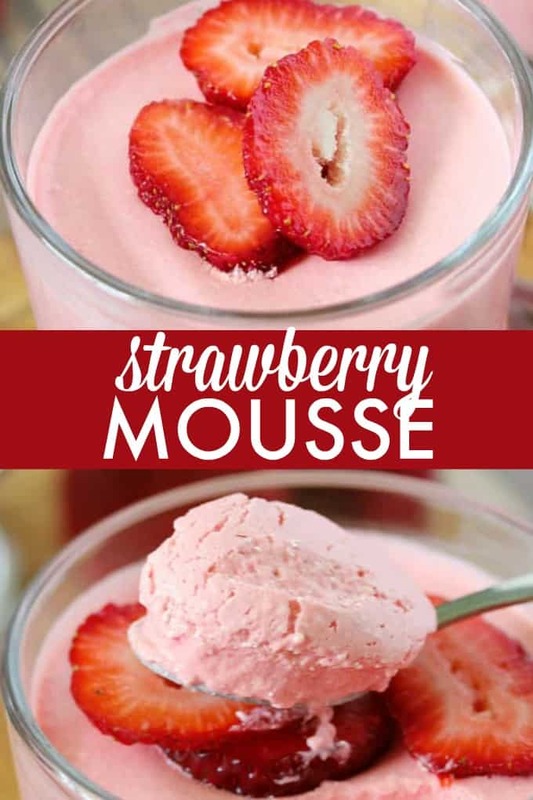 Sweet, light and addicting, this Strawberry Mousse recipe is an easy, no-bake recipe your family will love! Add Jello package to a medium bowl. Pour in boiling water and stir until completely dissolved. Pour Jello mixture into a blender. Add strawberries, cream cheese, vanilla extract and cold water. Blend for 1 minute or until smooth. Pour blended mixture into a large bowl. Whisk in Cool Whip until completely blended. Add mixture to four dessert dishes and put in the fridge for two hours to set. Garnish with sliced strawberries and Cool Whip, if you wish. Oooooh this sounds so refreshing and amazing!! I would add some mint to the garnish 😉 To make it a little more summery!! Perfection!! Yum Yum!! and with cream cheese!!!! yummy! My children loves anything strawberry flavored. I will have to make this for them this coming weekend. Looks delicious. I just mentioned it to them and they went crazy! My favorite mousse recipe would have to be french silk mousse. However, I’m sure this would come in second. It looks fabulous! I would not have thought this would be so simple to make. Oh yummm!!! I need to make this, sounds so good and divine!! My mouth is salivating just looking at this images… Yum! Thank you! Yum! I just bought some strawberries so I am definitely going to make this for dessert tomorrow night! This is a must make. It’s the perfect treat as homegrown strawberries are here! This looks so good! Perfect for summer! Printed recipe, I’m going to make this Saturday, my children and grandchildren are coming for BBQ Ribs. I think they are going to love it! I’ve always been a fan of chocolate mousse. I’ve never tried Strawberry! Sounds so delicious! I like light desserts and this is a good one. OH I am pinning this one!! Gonna buy me some strawberry jello today to make this to try for Canada day holiday weekend. Thanks for the recipe….looks fantastic!!! That looks delicious, I love anything with strawberry. I’m going to try this recipe soon. This looks so pretty! I think this would be a great recipe for a casual BBQ when you want something light and refreshing on a hot day. I personally am Lactose Intolerant so I always have to make something for myself with Cool Whip, so I don’t have a favourite myself. This looks so tasty and delicious. I’ve never made mouse before but after seeing these pictures, it’ll be added onto my list of things to try. Thankyou. This sounds so good. Perfect for summer. That looks delish – can I have some strawberry mouse now please? 2 of my cats like banana strawberry yogurt, I save a 1/4 tsp for them when I’m eating it. Looks perfect! thanks for sharing on craft schooling Sunday! Mmmm, this looks so delicious! I may have to whip up a batch of this; definitely something my guys would like. Thank you for sharing at Inspire Me Wednesday. Featuring you in this week’s issue. This sounds lovely! Ive never made mousse and I don’t have little dessert serving dishes. Do you think this would set alright if it was in a shallow casserole type dish? 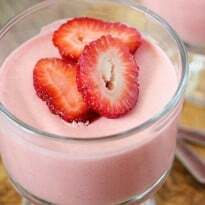 This Strawberry Mousse is such a wonderful dessert, especially for summer when fresh, sweet strawberries are available. I have already saved this recipe to my favorites and thank you for sharing it with us. Do you think a mousse like this would hold up as a filling for a cake. It sounds delicious! I’ve never tried it that way so I’m not 100% sure! It should though. Let me know if you do try it. I’ve never used it in cake so I’m not sure, but let me know if you do use it! Would I be able to let it set in a chocolate bowl ?